Relatives. We all have them. Like most families you probably have some relatives you love and others that you avoid. I come from a huge family. My grandmother had six children, her mother had twelve, her father was one of twelve kids, and his father was one of twelve kids, you get the picture. Since my ancestors were so good at making babies, I now have hundreds of cousins and more aunts and uncles than I can count. When there are that many people you are related to you are bound to have some relatives that are “different.” I have an uncle that some would put into this category, he is one of those doomsday prepper types who lives out in the middle of nowhere and is prepared for everything from a nuclear attack to an alien invasion. Some people may think he’s crazy but I think he is a genius, in a crazy sort of way. When you live out in the wilderness and get everything you need to survive from the land, you spend a lot of time by yourself cutting wood, growing crops, or building secret bunkers and when you spend that much time alone all you have to entertain yourself are the thoughts bouncing around in your own brain. Most people have too many distractions to give themselves any real time to think, but in the wilderness your mind wanders and you wind up either concocting an elaborate conspiracy theory or having a moment of clarity that creates a little nugget of wisdom that warrants being recorded by pen and paper like Thoreau on Walden. My uncle has emerged from the wilderness on many occasions with these little gems of brilliance that I quickly record in my computer in hopes that someday I may get them all into a book of some sort. On one occasion I happened to be with the staff at snowmobiletrail.com when we bumped into my uncle and during the course of one of his philosophical discussions he told us something that has become the snowmobiletrail.com motto: “Life is about making memories.” The theory behind this simple statement is that no one ever remembers the routine stuff that they do every day: going to work, watching TV, doing chores around your house etc., it is the unusual events in your life that you remember, the times that you break from your daily routine to do something unusual or special. Therefore, my uncle decided to try to do as many things as possible that are out of the ordinary and fill his life with memorable moments, and it’s easier to do than you think: catching baseball game after work, exploring an unknown area of woods, or hoping on the sled or four wheeler. This is the reason we adopted his motto at snowmobiletrail.com, because snowmobiling is never routine, you have no idea what is going to happen or what you are going to see when you turn onto the trail. You have a unique opportunity to create a great memory every time you ride. My daughter is in typical modern day teenage mode now- she lives on her smart phone- always playing games, watching videos, or talking with her friends. If it isn’t the phone it’s a video game, her PC, the TV or whatever other electronic gadget she can get her hands on. As a father it’s my job to somehow break through the electronic jungle of clutter and I do that by getting her out on the trail. She is always reluctant because she is cut off from her friends and her electronic world out on the trail and forced to spend time with me, which, at this point, is no longer cool. When I laid this whole memory theory on her two winters ago she dismissed it, but I could tell that it hit a chord with her and that she just didn’t want to admit it. Ironically my theory was proved correct just two weeks later when we took our weekly Sunday ride out to the lake to our favorite trailside bar/ restaurant. As we sat there eating our burgers it started snowing and by the time we left for home we were caught in a full blown winter storm. The journey back quickly turned from what is normally a casual ride to blasting through thirteen miles of huge snow drifts and deep powder, a true adventure indeed. 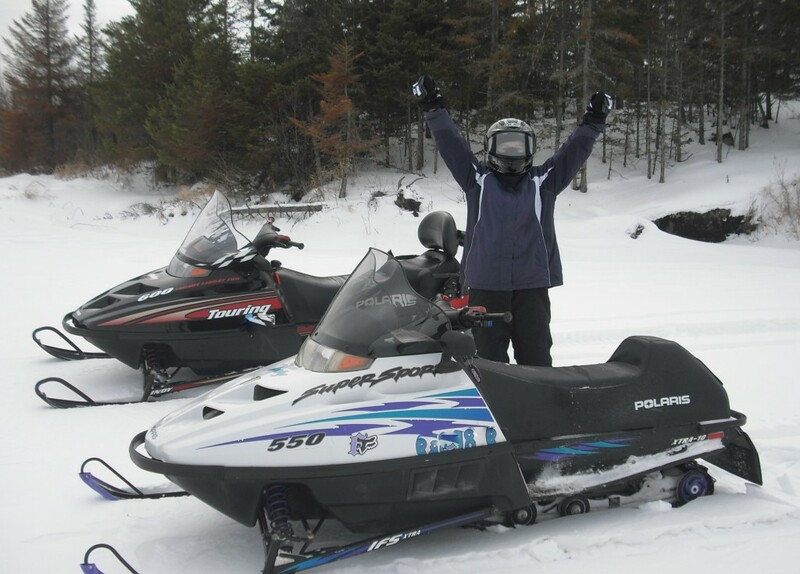 To this very day it is at the top of her list of favorite snowmobiling stories to tell to her friends, and I always use it to coax her out onto the trail whenever I see her getting mired in the electronic abyss. You can spend hours sitting in your room watching You Tube videos and chatting with friends and all of that time will come and go like water under a bridge and it will amount to nothing- but a ride like that you will remember forever. The key here is that we never know when that ride will come, when we will see something so amazing on the side of the trail that we will never forget it. That is the opportunity that snowmobiling affords you and your family and your friends- an opportunity to create memories that will last a lifetime, rides you will remember forever. That is why snowmobiling is one of the greatest winter recreation activities there is- a chance to see things that you have never before seen, an opportunity to go places that are inaccessible at any other time of the year by any other means of transportation. As the old Bombardier marketing slogan used to say- “To trod on that which was heretofore untrodden.” Indeed. This entry was posted on November 11, 2015 by John Hartley.